As I began to read this brilliant book, I was reminded of James O’Toole’s contribution to a book he co-authored with Warren Bennis and Daniel Goleman, Transparency: How Leaders Create a Culture of Candor, when O’Toole discusses “speaking to power.” He briefly examines several plays (Sophocles’ Antigone, John Osborne’s Luther, and Robert Bolt’s A Man for All Seasons) whose protagonist offers a reminder to leaders in our own time of the responsibility to create a transparent “culture of candor.” O’Toole also examples of organizations that do — or do not — have such a culture, those whose leaders are – or are not — “constantly willing to rethink their most basic assumptions through a process of constructive dissent…about such often-taboo subjects as the nature of working conditions they offer employees, the purposes of their corporation, and their responsibilities to various stakeholders.” Whatever the size and nature of an organization may be, O’Toole insists, it must be one “one in which every employee is empowered to speak the truth.” Trust must be the essential ingredient to its effectiveness [and is] the most elusive and fragile aspect of leadership” because it is so difficult to earn but so easy to lose and, once lost, nearly impossible to regain. Gentile frames her narrative within a structure of several assumptions about her reader. For example, that her reader wants to voice and act on her or his values; has already done so in the past, with mixed results; can do so more often and more effectively than before; has found it easier to voice her or his values in some contexts or situations than in others; is more likely to increase frequency and effectiveness of voicing and acting upon values after focused and rigorous practice; and can offer “a powerful example” to others to voice and act on their own values more often and more effectively. 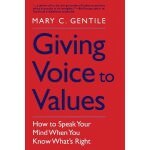 Readers will greatly appreciate the fact that, before concluding her book, Gentile provides various resources (including some self-diagnostic exercises) that will help them to review key points, identify and then evaluate their options, and then formulate an appropriate action plan. She includes a “To-Do” list on Pages 244-245. For some people, hopefully for many people, this will be the most important book they ever read IF they absorb and digest the wealth of information and counsel with meticulous care. I urge them to highlight or underline key passages and review them frequently… and re-read the entire book again in 2-3 months. It will reward their attention generously. More to the point, it will strengthen the skills they need to think more clearly and to assert themselves more effectively. 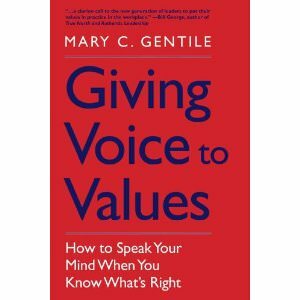 Mary Gentile does more, so much more than encourage principled people to speak up and take action when they know what’s right and what must be done. She also prepares them to speak with greater eloquence and to increase the impact of any actions their conscience compels them to initiate. Bob Morris is an independent management consultant based in Dallas who specializes in high-impact knowledge management and accelerated executive development. He has also reviewed more than 2,200 business books for Amazon’s US, UK, and Canadian websites. Each week, we will add to the Networlding Business Bookshelf abbreviated versions in which he discusses a few of his personal favorites. To contact him directly: [email protected].